At the corner of my eye sits a couple of superhero figurines on display. Iron Man and Spider-Man with their bright red costumes stand out in the room, as their visual appeal is compounded with childhood nostalgia. As a kid, I embraced Marvel’s superhero universe. Through comics and syndicated Spider-Man cartoons, I quickly immersed myself into the histories behind every character. And when Sam Raimi’s Spider-Man came out in 2002, my interest in Marvel’s enterprise resurged. But since then, I’ve found it very difficult to look at their material as anything with true substance and emotional weight. Whereas Christopher Nolan took DC Comics’ Batman character in a much more brooding and complex direction with Batman Begins and especially The Dark Knight, Marvel’s characters seem to operate under a clear distinction of good and evil with no shades of gray. This issue is the fundamental reason why I can’t wholly embrace the recent onslaught of Marvel pictures, largely because it’s so cut-and-dry. It’s typical and on-the-nose, wherein heroes and villains dwell in a realm of emotional stasis. These characters don’t develop into anything or anyone – they simply offer rudimentary one-liners for approval. I may be looking at The Avengers through a critical lens here, but I can’t hide a sense of dissatisfaction with films of this type. This type of film is constructed as a giant advertisement for these thin characters and their next films. So much of what is going on on-screen feels like the workings of a child’s midday action figure romp where they mouth off explosions. And it’s not like I’m averse to a comic element in a comic book film, especially given that Tim Burton’s Batman Returns is my favorite film in this genre. But at least that film had characters that had some sort of transformative element. A tinge of sorrow and emotional resonance is truly reflected in the four leads of that film. With The Avengers, there’s a lacking sense growth. Characters don’t escape a confining box of being either a hero or villain without ascending to a grander emotional plane. Having only a passing knowledge of Wheadon’s work, I thought him to be an interesting choice. His ability to work within the team dynamic of his characters is The Avenger’s strongest asset. A scene where all the members of the team bicker over the motives behind the picture’s central villain is greatest example of Wheadon’s strengths. It’s the best scene in the film, where these superhero characters begin to take some shape. But it’s all undercut by Wheadon’s incessant desire to wink at the audience and offer some sort of quirky one-liner offset emotional anxiety. And if it’s not Wheadon shooting himself in the foot, it‘s the genre that dulls the senses with prolonged actions sequences, where our heroes battle faceless foes. I’ll freely admit that the picture’s early action sequences drew me in for their visceral appeal. But that dynamic was really because of Wheadon tinkering with expectations. An earlier sequence where Thor, Iron Man, and Captain America served as combatants in a dark forest setting may have subverted the norm. But when the norm is a Michael Bay picture, there needs to be something substantial done to inspire acceptance of the material. 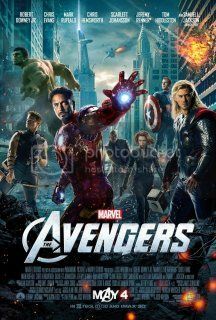 The Avengers largely adheres to blockbuster tropes instead of complicating them.